We recently spent a few days in Umbria and even if we generally write about Tuscany on our blog, on this occasion we’ll make a small exception to tell you about this region bordering the south of Tuscany. You have to travel through Umbria if you’re traveling between Rome and Florence, so many visitors to Tuscany often stop along the way to visit a few of the beautiful towns in the region. This isn’t the first time we’ve visited Umbria: we’ve returned on several occasions because we’ve enjoyed its wild nature and its historically rich cities, while the great food and good prices have called us back time and again. Our small trip lasted four days in which we visited the waterfall at Marmore, the small city of Narni, Spoleto, Assisi and Gubbio. The waterfall at Marmore was our first stop. 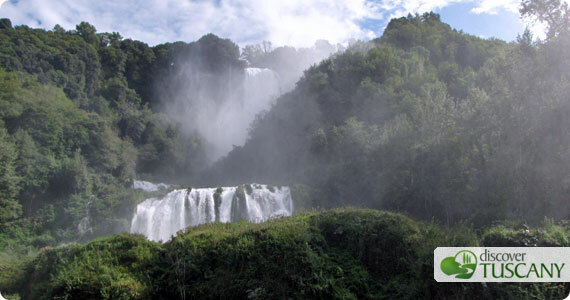 This beautiful waterfall, one of the tallest in Europe, is in southern Umbria in the province of Terni. The waterfall offers an enchanting spectacle: the water falls on three separate levels over a height of 165 meters. To visit the entire area of the waterfall you can choose among 5 walking paths, each offering a different difficulty level and lasting from 20 to 60 minutes. We highly recommend following at least two of the paths to see different views of the waterfall and, if you’re in good shape, you could do all of them! Once we arrived to the top of path #2, a magnificent rainbow was waiting for us. It is important to know that the waterfall is not always flowing as the water is actually used to produce electricity! During the week, water passes through only certain hours while it flows freely on the weekends. So check out the official site of the waterfall to see when the best times are to visit during weekdays. Narni is a small city in the same province of Terni. We added it to our list of places to visit, not so much because it is said that this city inspired C.S. Lewis in his “Chronicles of Narnia”, but because we were excited to know it was possible to visit some of the underground tunnels that make their way under the city itself. Narni Sotterranea (Narni Underground) is a journey of discovery of the tunnels and rooms of the Convent of San Domenico which were a secret for centuries. On our visit, we admired an ancient Church dug out in the rock, with frescoes going back to the 13th through 15th centuries and several rooms where the Domenicans participated in the Inquisition. It was both interesting and frightening to walk into a small cell where the accused were held, the walls covered in scratches and graffiti. The entire route is in the company of a guide that passionately introduced us to the tunnels, to the history of the Convent and to Narni. The entire tour takes about an hour and is a unique experience. We were particularly impressed by the skill in which the guides explained everything both in Italian and English, an uncommon undertaking given that they are all volunteers! The city of Spoleto let us down somewhat. We had imagined it a lively city, but even on the weekend it was very quiet. This is not to say you shouldn’t visit! The Cathedral of Santa Maria Assunta is really beautiful with frescoes by Pinturicchio and Filippo Lippi. 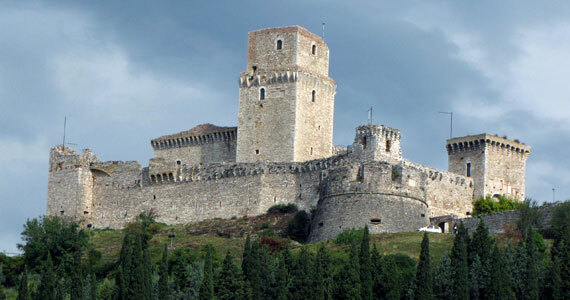 The Albornoziana fortress sits atop a small hill overlooking the city. Born as a military fort in the middle of the 1300s, it was a prison for over a hundred years starting in 1800. It is imposing and offers a wonderful view of the area. It has several large halls and numerous frescoes but overall it seemed a bit bare (the entrance cost is 6-7 euro so we’re not sure it was worth it). We ate well during our entire trip in Umbria but we did find an excellent restaurant in Spoleto, Il tempio del gusto (the temple of taste). The environment is charming yet private and is small enough to warrant making reservations to make sure you get a spot. It is perfect for a romantic dinner but small groups can likely be accommodated. The menu includes typical dishes from Umbria (often revisited) as well as more particular dishes. Everything was presented with great care and we even received small complimentary morsels “offered by the chef”. We definitely recommend you add it to your list of places to eat at! Assisi is famous all over the world for being the birthplace of both St. Francis as well as St. Clare, founders of the Franciscan and Clarisse orders. The two beautiful basilicas are dedicated to the saints and millions of pilgrims and simple visitors visit them each year (over 1,400,000 visitors recorded in 2008). The Basilica of St. Francis, divided into a lower and upper section, is truly imposing. The upper basilica conserved a beautiful cycle of the life of St. Francis that many experts attribute at least in part to Giotto. From the lower basilica, one descends into the heart of the church: the crypt of St. Francis where the body of the saint rests. This is without a doubt the most evocative spot in the basilica even if it is the barest and most essential place within. The city is very well take care of, but aside from the two basilicas the town doesn’t offer much more. The streets are full of souvenir shops for tourists, expensive and not of the highest quality. Avoid the souvenir shops and you will find nicer artisan shops away from the basilica. 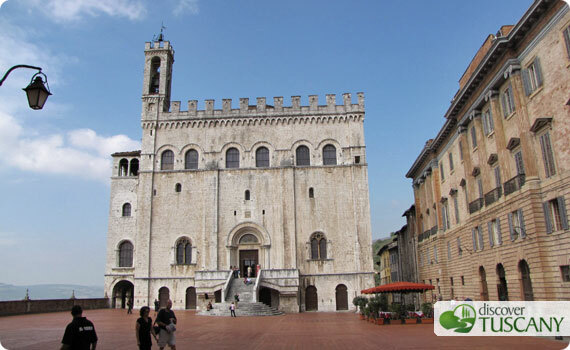 We highly recommend visiting the Basilica of St. Mary of the Angels, located a few kilometers outside of Assisi. The church is built around one of the most important spots for Franciscans, the Porziuncola, a small church now completely within the basilica where St. Francis would pray and where he experienced important moments of his life, from the revelation of his vocation up to his death. The basilica is extremely interesting considering it was built precisely to protect the small and precious Franciscan chapel. The medieval city of Gubbio is the town we enjoyed the most. The center is a tangle of narrow streets which are a pleasure to walk through. Piazza Grande is very beautiful, designed to be the center of the city with the imposing Palazzo dei Consoli and Palazzo del Podestà facing onto the square. Compared to the other cities we visited, Gubbio seemed lively and both the homes and palaces and streets were particularly well taken care of and clean. At the top of Monte Igino, with the city built on its slopes, you’ll find the basilica of Saint Ubaldo, patron saint for the city. You can get to the basilica by car as well as by a small cable car which departs from the city’s center. The route and view you can enjoy from the cable car must be very suggestive, considering it goes all the way to the top at 850 meters above sea level but we don’t recommend it to anyone who, like myself, is afraid of heights since the car is for just two people and looks like a bird cage! So you can go and see it and decide if you want to ride it up or not. Once you’ve entered the basilica of Sant’Ubaldo you enter into a grand cloister made in Roman bricks. The interior of the church is very bright, the marble altar and beautiful stained glass windows at its back with scenes dedicated to the saint both stand out. In just a few days we were able to see many beautiful places we had yet to visit, the four days were full but very relaxing. We recommend this itinerary to anyone that wishes to discover some of the small treasures in Umbria!